The ratcheting - does it happen just before z homing? If so it's firmware, there's a line "safe homing" something or other "raise z before homing" = 5mm. This is trying to push the z axis down even further before it raises to home. There is a presumption that the z axis lifts up the head rather than moves the bed towards it and that you start near to z min not z max. Set it to 0 but be aware you might get a head crash with a binder clip or other obstruction if you home z near to z min. I am going to put springs at the base of the z smooth rods to give the motor a helping hand getting the z axis up initially and provide a softer landing on sudden power off. I've added G1 Z135 F1500 to my end gcode before the motors off command, for a nice controlled descent after printing. Yeah I ordered the steel belts from ebay they came from a German company but the ones you linked to are the right ones. They're a bit unyielding and a bit more sensitive to the drive pulleys being at the right height. The machine is quiet now which is nice, I'm using quiet motors. Bought two more spare ones and one was lovely the other barely turns. Will send it back. Tried the little boat test object it's alright I suppose. Edited 1 time(s). Last edit at 02/25/2016 12:16PM by DjDemonD. 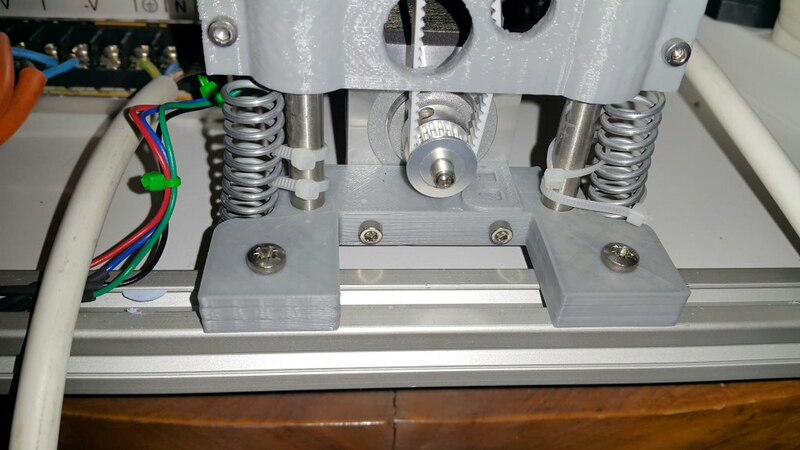 I've put some springs at the bottom of the z axis I was going to put them over the smooth rods but don't want to dismantle my z axis at the moment, I will do this later. But they work. Nice soft landing now. I've been trying to get the 5v arduino power problem solved also. I've tried feeding 5v from a regulator into both an endstop 5v pin and the 5v vcc pin and whilst it powers the arduino without usb connected my z min endstop shows permanently triggered. So without checking the d1 diode is correctly installed or soldering a new voltage regulator onto the arduino (or swapping it for a new one but seems a shame to swap a genuine arduino for a cheapy clone) I still haven't got this solved. I run the printer through a powered usb hub so can still print from sd with the pc off buts it's not ideal. Thanks for the tip on the Z-Axis, that is exactly what was happening and is now resolved. So, I have the same USB power problem you speak of, the easy fix for me is to feed 5v from a spare connector on my ATX power supply to the Arduino. In all honestly I figured I fried the diode because there was a moment trying to get voltage on some pins where the board let out a puff of smoke back some days ago. It seems strange that yours is the same. When you were tweaking voltages did you end up improving anything or was it just the cheap motors? I have mine set to .45 z/x/y and .55 for the extruder at the moment and they seem mighty noisy. I think I'll wait until I have the steel belts and new pulleys(bearings) to replace the motors. That way I can rip up the whole lot at once but I want to print new parts before that as well. So I'll deal. I ended up changing motors because the stock motors were only quiet with too little current and were missing steps. I turned it up a fair bit and they were noisy. I looked up their specs these are only 0.5A motors when the more normal 1.7A motors are available. I'm using one of the stock 0.5A motors in my mk8 extruder (as I took the two 1.7A motors out of the mk8 extruders to use for the x and y). I definitely got a short circuit when I was trying to sort out the hot end fan wiring I think I shorted the aux 12v connector with my multimeter probe. It may have blown the d1 diode or the arduino regulator. Its not too high on my list at the moment. Edited 1 time(s). Last edit at 02/26/2016 03:46AM by DjDemonD. That's crazy that we both did the same thing with respect to the board... well, I agree its annoying mostly. Printbite on the ALU mk3 bed worked great, I did have to lower the induction sensor a bit further but I'm getting reliable homes everywhere on the bed. Which pulleys did you find rubbing? the one's on the X carriage or the back corner ones? The back corner ones were a little tight - added some washers. Also I uploaded a new part to thingiverse appended to the x and y brackets, it's the part holding the sliding rod on the R side motor mount. It now has a lug to keep it in the frame which stops the motor tilting forwards under belt tension. Got the printbite installed and boy is that nice! Here's a video of my machine in action... I think most of that noise is coming from the back pulleys but I'm going to wait a bit to tear all the belts and pulley's up. Looks cool. Very noisy though, I can almost guarantee it's the motors. If you pull the belts manually through the pulleys I am sure they'll make very little noise. I've been using printbite on my i3 for ages and yes it's the best printing surface I've used once you've got it stuck down. Still using the stock extruder, honestly it hasn't given me a reason to replace it yet -I ran several 2+ hour prints without any issues. Spindles are nice, what recent changes have you made? I'm certainly sure this machine can match my i3 as my daily drive. It's currently nowhere near my kossel which is running a 0.3 nozzle, in terms of precision and resolution, but I'm after something that'll print larger stronger abs parts. I'm leaving the kossel for the arty delicate stuff. Might turn the i3 into a laser engraver. Haven't had much time to work on the smartrap this last week, haven't even tried any abs yet. Have you seen the 300xl? I wonder if they'll make an upgrade kit for the core alu to turn it into a 300xl? I'm not sure I ever need to print anything that big I just want one. That is huge, I guess that's why I wanted to build something out of ALU. You can just keep upgrading things with bigger/longer parts. I don't think there's anything notable over your last config other than some tweaking on bed points. I uploaded my most recent Config.h file to the atheimer branch of github if you want to check it out. Lots of calibration cubes mostly. I'm getting really annoyed with the Arduino / Ramps power issue. I bought a stash of diodes so I think fixing that diode will happen this weekend. 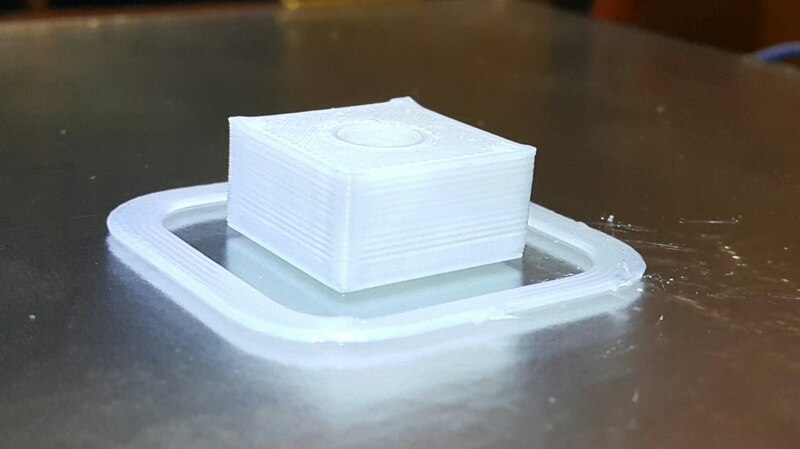 I debated between going CoreXY and a Delta, at the end of the day I didn't like the round bed and the calibration sounded like another world but maybe later. Like you said you can always convert these guys into other tools once the core mechanics are stabilized. I wonder if I might replace the board with an all in one like the MKS base 1.3 (which is used on the 300xl) or even a Geeetech board - everyone hates Geeetech but I posted asking peoples experiences with these boards and I had a lot of prejudice but no real facts and also one positive report). Whilst a 32 bit board sounds nice I'm not sure the corexy needs it, you can make a good argument for the delta but even then only when you're printing fast (which seems to be going out of fashion). In fact the speed issues even on the delta are usually only slight in nature, its a shame we can't overclock the mega 2560 by just 10-20% which would probably do the trick, it doesn't even have a heatsink, surely it can be made to run a little faster with one? I am writing a post to see what peoples opinions are on expanding the core alu to a 300x200 bed. 300x300 is too big for me but it would be nice to be able to print a larger part in at least one of these dimensions. My i3 runs on a Duet and I love it. Since day 1 it has been fantastic to work with plus dc42 is all over the place answering every question you could ever have. I have the Touch Panel & his IR modulated sensor on my i3 and its a nice setup. I do with the Duet could support the standard Marlin LCD's the touch screen is nice but mostly necessary. Well I haven't tried any 32 bit boards yet, mainly its the cost that puts me off, plus not being able to see that it would make any immediate difference to my printing, and needing to learn a new firmware from scratch when I think I've a reasonable level of competence with Marlin. I also think its the case that most 32 bit boards are hugely more capable than we need them to be, and are newer and shinier hence the cost is higher. Ramps/Mega is tried and tested and whilst its imperfect I am in the group of people who have never really had any issues with it (aside from this voltage regulator/diode problem on the smartrapcore alu). I think most of the issues people have are the result of a lack of knowledge and skill with electronics i.e. wiring things wrongly, not sufficiently tightening connectors, using inadequate wiring. As the price of 32 bit electronics comes down then at the point when my ramps/mega fail then replacing them with a 32bit controller will make sense. What got you thinking about a better board? I'm curious as I'm watching a print and it looks really "jerky". The printhead seems to pause for split seconds frequently and I'm wondering if it has to do with the RAMPS being under-powered? I can see what you mean but no I'm not thinking about a faster board - I'd like the voltage problem solved, the ability to use 24v and am curious having not used an all in one board before. Trying to get my flex3drive fitted to the smartrap now, it's a pain I have to design a custom mount, not sure anyone has used one on this printer before. Edited 1 time(s). Last edit at 03/05/2016 09:25AM by DjDemonD. So flex3drive work in progress, it's a cool gadget but I've had to make a custom mount which is pretty quick and dirty, plus I am having some problems which I think might be hot end temp related. I'm measuring my actual hotend temp as 20 deg C below the reading on the printer. I've use an IR thermometer and a thermocouple thermometer and my 210 indicated is only 190 actual. Have you measured yours? It's setup as thermistor 13 in the marlin table which one I've not come across before. I wonder if this is the right thermistor? I might try a few different thermistor tables and see if I can get one that comes up closer to actual temperature. This means I have been printing pla at barely 190 no wonder it wasn't sticking too well at first when I was actually at 170. Okay so thermistor 13 is wrong its an epcos which is table 6 in marlin rc3. Ive tested it and now its just 2 degrees out. Okay so flex3drive working took quite a lot of messing around with but it works and the results are stunning. As expected it blows the bowden setup out of the water. I've attached a photo of the latest test cube, tiny bit of corner uplift agreed but the rest of it is sharp. Dimensions 20.1mm x 20.07mm x 10.07mm so I'll take that. Thermistor fix makes a big difference. Also another interesting thing I found out, I had to take the stepper jumpers off as I wanted to get 1/4 stepping on the extruder (the flex drive is geared 40:1 so it would need 3200 steps per mm which is a bit high), I couldn't get it to switch off 1/16 stepping (which still works with 3200 steps/mm) but this thread yielded some interesting information cheap ramps board issue. Turns out there is a batch of badly made ramps boards which have the jumpers soldered (or have tracks) across the base, so effectively they're not capable of anything except 1/16th stepping. The really odd thing is why do they bother to solder the 3x2 jumper headers and populate them with multicoloured jumpers when these are effectively, on these boards entirely for show? It also seems odd for Smartfriendz to go to the expense of providing a genuine Arduino (first time I've actually seen one!) but provide a poor quality ramps board. I intend to request a new ramps board from Smartfriendz (hopefully won't have the very easily blown regulator which we both oddly suffered with). Edited 2 time(s). Last edit at 03/06/2016 05:55PM by DjDemonD. I downgraded to the stock LCD this weekend and it eliminated the stuttering print issue, so no graphics for me. 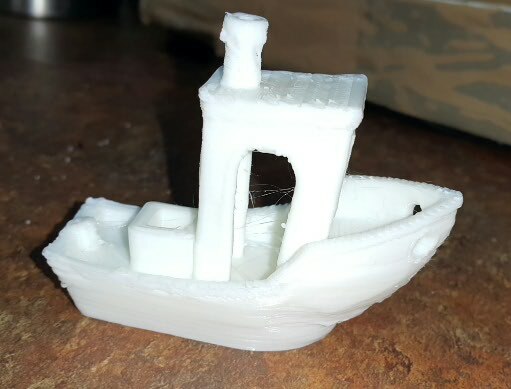 I put about 10 hours of printing on my machine this weekend and its doing everything well -except bridges which is to be expected with no part fan. Your story about the hotend temperature is crazy, no I have not checked its accuracy but have not encountered a reason to. Printing Hatchbox Black PLA at 185 right were I would expect it. Bed temp is +-2d so I never questioned the hotend. I do have it on my list to run the PID autotune as it overshoots target temps by quite a bit when first heating up. I'll hit mine with a thermistor tonight and let you know what I find. I was wondering if linear rails might be the way to go; easy fix on the y axis, would need a fair bit of change on the x. Especially as I'm thinking of taking it up to a 20x30cm bed. Will try it with smooth rods first it's a fairly easy upgrade. Going to swap the ramps too for a better quality one and maybe test/swap the regulator on the arduino while I'm at it. Just out of curiosity, what retraction distance and speed have you been most successful with? I've been happy with 4.5mm and 30mm/s but am wondering if its a bit too fast or too far? I'll play around just thought I'd ask. I was using 2mm and 100mm/s it's was mostly okay. It's different now I've changed extruder it's a bit of a challenge getting ideal extrusion with a 40:1 reduction. I'm out of action at the moment as my attempts to repair the arduino have resulted in killing it. Should have another hy tomorrow. Just a bit of info I found, the inductive sensor supplied works on 5v without voltage dividers etc. I wired it direct to the endstop +, -, signal and it works perfectly. I noticed my arduino failing manifested as the sensor triggering incorrectly. Edited 1 time(s). Last edit at 03/12/2016 06:44AM by DjDemonD. When you made your e3d groove mount holder (http://www.thingiverse.com/thing:1360019) did you actually switch your hotend to a real E3D? Just wondering if the stock mount will fit the E3D or I should print the replacement first. Thanks for adapting the Z axis, it looks great! Unfortunately I haven't had much time to work on the printer lately but hopefully in the next couple weeks. I didn't fit a genuine e3d, I temporarily fitted a clone v6. 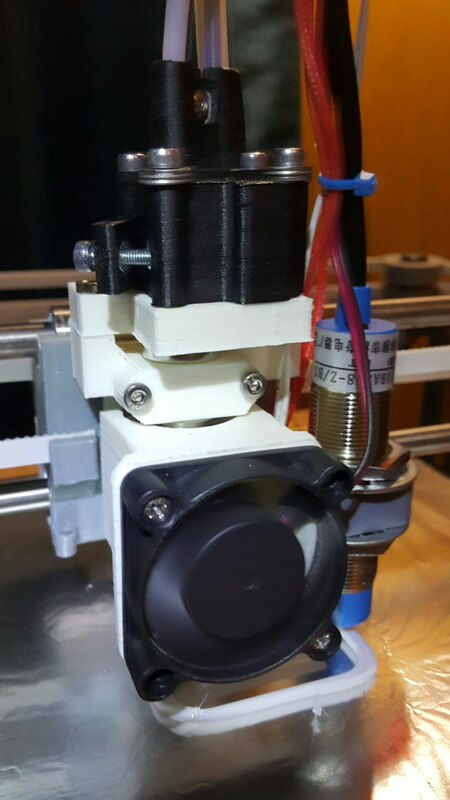 I think the stock mount will fit a genuine e3d but if you want to fit a v6 you'll need to relocate your x endstop to the carriage end otherwise it hits the bed when homing, due to the shorter hot end. I think because this mount clamps around the hot end rather than really using the groove it's much more tolerant of slightly different hot ends. Finally swapped the original nozzle I was fairly unimpressed with for a nicely made one and the difference is stunning. I suppose lesson learned the nozzle is like the car's tyres isn't it, it's really the business end of the machine. In any case I am finally happy with it it's performing really well now. This print is a door for a child's washing machine toy. Have installed 16 tooth drive pulleys on the x and y motors to supposedly improve resolution. Not sure if it makes a big difference or not but the ramps board is coping with the extra steps. Might do the same on the z axis but since its a 0.9deg stepper and seems to happily print 0.1mm layers probably isn't worth it. Been busy the last few weeks but finally back to printing after the latest round of upgrades. - Swapped out the original hotend for an E3D v6 Lite, the nozzle made a HUGE difference in print quality as you stated. Also, the "back"part of the hotend clamping piece is cracking... I when to the OnShape file to print another one but the right screw hole appears "cut-off" Did you reprint this part? Wondering what you used or encountered this? I attached the .stl for the part from the SF Onshape doc. This really works well. I have absolutely no complaints with it, coupled to 0.9deg stepper and 0.1mm layers are no problem (they might have been okay before), I have to say belt driven z axis wasn't something I was that familiar with but this way of doing it has convinced me its very effective. Also this axis descends gently when powered off so none of that crashing downwards or having to have landing gear. Mine is too, but I never get around to doing proper cable management. No and I am going to chase them up about this. It's very annoying for someone to say something and not do it. Well this one [www.thingiverse.com] I have been using on my Kossel Mini for 9 months now and it has been quite reliable, there is a strengthened version but I've not broken mine yet. That being said I was fairly happy with the mk8 I was using before I tried the flex3drive. If I could get the bowden tube really short like with the flying extruder for kossel (maybe with a suspended extruder on elastic above the print head) then flex3drive would be unnecessary. My kossel with 10cm bowden tube prints like it has a direct extruder sat on top of the hot end. Ive not used the airtripper it might be excellent but it looks a lot more complicated than it needs to be. I wonder if given that keeping print head mass low on the corexy is slightly less critical than it is on a delta whether a lightweight direct extruder on the print head might be quite doable. I notice they have gone for this design on the 300xl so stls should be available. Edited 2 time(s). Last edit at 04/07/2016 06:07AM by DjDemonD.